Apparently, a 'surprise' coach load of English tourists just turned up at the Frog Family House. Frog is currently in a van on a motorway, somewhere between Calais & Dunkerque. Mother, Brother & Sister-in-law Frog are at home trying to work out what to do. I think with a free glass of champagne, the English group might not be too worried about their hosts' lack of English language skills. "The following does not take place between 7pm and 11pm"
I am home alone tonight, eating two pork chops that had been marinated in a tamarind and honey sauce. The Frog is in a cellar 'dressing bottles'. That is not a euphemism. Unless I missed something in the Handbook to Life in Reims. I shall now make my way to the bathtub where I expect to soak for a long time in the company of a book. The only reason I am not curled up on the sofa is because I am forbidden to watch any of the 24: Season 4 DVD episodes (that I bought in the UK last weekend) on my own. Grrrrrr. Mug of tea; pheasant paté with berry jelly; steak & kidney pie with suet crust; strawberries with clotted cream; half pint of local ale; quiche; potato salad; tomato salad; cheddar cheese & water biscuits; white wine. Mug of tea; orange juice; tomato & basil sausage; bacon; fried egg; toast; field mushroom; kidneys; fried tomato; champagne; champagne; champagne; canapés; roast vegetable terrine; beef; roast tomato; runner beans; red wine; lemon tart; champagne; coffee; wedding cake; white wine; sprite. Cup of tea; toast; sausage; cup of tea; bacon; tomato; fried egg; cup of tea; fresh plaice; new potatoes; chives from the garden; swiss chard from the garden; white wine; water; armagnac stuffed prune; coffee; chocolate cake; café latte; lamb curry; rice; summer pudding; water. It's nearly lunchtime and Frog has just called to say he's on his way home. A morning cutting the last of the grapes to the floor, all the quota collected, reserves put aside and a little extra for home consumption. Harvest is done. Let the bells ring out and rejoicing across the flat. No more 9pm bedtimes, no more 6am alarms, no more grunted, half asleep conversations. When we finished early for the day on Sunday, Frog headed off to get a couple of DVDs out so that we could collapse in front of a couple of "braindead" films. He came home brandishing two selections. The first, Terminator 3. I think we can safely say that fitted the qualification. Oiseau: That'll be A Beautiful Mind. Do you know what that's about? Frog: No. It's got Russell Crowe in it. Oiseau: It's about a Nobel Prize winning mathmatician's struggle with genius and schizophrenia. Oiseau: Not such a braindead film. To his credit he stayed awake throughout and pronounced it a good although definitely not braindead film. I've spent this morning in our study doing some online research (yes, proper work) with a new found toy talking in the background. Well, it's Tony Blair I'm currently listening to but the new toy, more specifically, is the Today programme podcast. I'm now working through the archive as I munch on bread and honey and sip my cup of tea. It's like a corner of Mum's kitchen has come into my North-Eastern corner of France. After a week of feeling quite ungrounded and a little lost (which culminated in a rather ugly late night, swollen eyed, cushion clutching then throwing, screaming fit) I think I might be finding my feet again. The prospect of getting on a ferry tomorrow night to head back home to Dorset for a long weekend and childhood friend's wedding is a refreshing thought. My hands are stained black, my back aches and I have a sunburnt nose. But I wouldn't want to feel any other way. 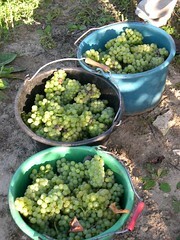 The grapes were ripe, the chardonnay golden and the pinots burst in your hands if you pulled them too hard from the vine. After a fairly miserable Saturday morning spent in the kitchen with the women (oh, the things my more anonymous blog would say), I joined the smaller picking team for a long afternoon in the vines. I also got up before dawn yesterday to go out with the one team working Sunday. The atmosphere is one of the best they've had. No fights this year, just some laughs, a few groans and I've picked up a little patois from the pickers who come down from the north each year. When we arrived at the vines at 8am yesterday morning, the mist was still hanging across the valley. As the sun rose and the day warmed up, a group of fifty odd ramblers walked past, pausing to take photos and wish us courage, whilst we stopped for our casse-croûte of beer and biscuits. 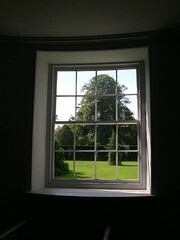 I'm now sat at home, 'working', looking out of the window wishing I was back out there. You can see the first set of photos here. As expected, whilst in London, I spent both of my two evenings in pubs/bars. The evening I arrived, my sister and I headed over to Peckham to meet her boyfriend for a drink and pizza in the local pub. Apparently, it wasn't the end of Peckham that this kind of stuff happens. There was a pool competition going on and boyfriend was waiting his turn to play whilst we munched and supped. Now, I know that anyone English of a certain age is going to be incredibly jealous of what happened. And let me be clear, this reflects the high-flying glamour of my jet-setting lifestyle. Trev of "Trev & Simon", of Going Live and Live & Kicking fame was in the pub. Playing in the pool tournament. And knocked the boyfriend out of the game. I know, some people just have all the luck. We didn't swing our pants. I also spent another lovely evening in a cosy bar in Fulham called Blue Orange. Highly recommended, run by a young Italian couple, Fabrizio and Maria, they serve a fine burger and I heard the tapas is good too. After leaving a very grey, humid London at lunchtime, I arrived home at 8pm. The front door unlocked in one click, which surprised me, as I thought I'd be first home. Today is the first day of harvest and I knew Frog would finish, have a drink, shower and then dinner with all the workers. I had had visions of me alone, unpacking, taking a bath and being assertively patient for the hour when Frog crawled home. "Hello" I called as the door opened, and I could see the flat in darkness. "'Ello", a rather small voice came from the other end of the dark flat. I left my bags in the hall and walked through to find Frog curled up on the sofa, in the dark, with the remenents of a cold supper and 'The Sure Thing' on pause. "I thought you'd be back earlier, but I couldn't wait to eat". "No, I said I'd be back about 9pm, but I got an earlier train. I thought you'd eat with everyone at the house. How was today?". "Fine, fine. I'm tired. We're working really fast, and didn't have enough panniers to keep going to six, so we stopped at 5pm. At this rate we'll be finished in six working days. But I thought you'd be back and we'd eat together." After a cuddled summary of our respective days apart, a quick sharing of gossip and news, Frog went to bed. At 8:30pm. I am exiled in the study. I have a stack of new books from London that I frustratingly can't curl up and start to read in bed, as the light will disturb Frog who'll be awake and back at the house for 6:45am tomorrow. I also got given my redundancy notice as a picker, being told that they have more than enough people this year. The explanation included that I should save my back and just come for the big dinner on Saturday night. And as a throw away comment, that Frog will be really busy and not be able to spend time with me. I think this comes from him needing to focus on the job and not feeling he should be looking after me (which is more his concern than mine as I think I'm quite an independent soul). But it leaves me feeling a bit left out. I know they're saying this for 'my own good'. But it means I'll have to do much harder stuff. Like the work I'm paid for. Which is much more boring! I'm off to potter around the flat until tiredness hits me too. Them: Hi, did you have a good weekend? Me: Yes, very constructive actually. I mean, I didn't leave the appartment all Sunday but we finished half of the parquet. Them: Oh, I remember you saying the evil builders destroyed them when they were working. Me: Yes, the evil builders dripped paint all over the wood and roughed them up so that half the varnish was gone. Them: Parquets are hard work, aren't they? Me: Yes, Frog never wants to see another paint stain again. But even though the steel wool he chose to use freaked me out, he got all the paint stains out. Them: But doesn't steel wool leave big holes in the wood? Me: Yes, that's what I thought as well and, actually, we had a big argument about it. 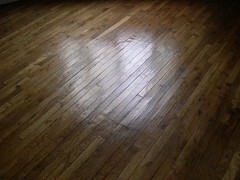 But with my many super products, patience and good old fashioned elbow grease, just look at the results! Anyway, I'm off tomorrow to London via Paris. Two days of discussing cholesterol lowering margarines, interspersed with time with my sister and friends. More than likely, in the pub. The day after I get back I'm heading straight into the vines for my 2 days of contribution to the harvest. It may be quiet here for a while and you can guarantee I will be complaining of back pain on my return. We were driving over to dinner last night at the Frog Family house - a chance for everyone to get together after Frog Father has been home a few days and to gather enough hands so that he could have a game of cards - when Frog glanced at me and remarked that I was being very quiet. "Just thinking", I said, "about my Grandma". I had spent the better part of the afternoon cooking a dessert to take over for the family. I chose to make a Lemon Surprise pudding, something both my Mum and Grandma used to make. It's a type of clafoutis with lemon sauce underneath and I had been cursing the fact I didn't have an electric whisk, as I strained to handwhisk the egg whites into the 'stiff, white peaks' that the recipe demands. I used to have Grandma's old electric whisk, but I guessed it was still in a box at Mum's, where I left it when I moved to New York. The pudding didn't turn out quite how I wanted it. The dish was too large and the top 'sponge' ended up spread too thin. I knew it would taste okay, but it wasn't what I wanted to present to the Frog Family. So, I spent the larger part of the afternoon complaining to Frog that it wasn't great, and then on handing it over to Mother Frog, apologised that it wasn't the best, that it hadn't worked out right. And that's when I caught myself imitating my Grandma. In the end we used to tell her to be quiet, as she handed us Sunday puddings, Christmas Cakes, boxes of biscuits and tarts for the week's packed lunch, always complaining that x,y, or z wasn't right with them. Of course they were always perfect, it's just she was a good cook and anything less than 150% perfection was considered under par. I miss my Grandma. I wish she knew how often I think about her. In most ways I am the opposite of her, I have the self confidence she never had, the worldly experience she never gained, but my life has not been as hard as hers was, and I don't have an ounce of the patience she usually displayed (and if anyone asks me if I want a cup of tea, I, unlike her, can give a direct answer, not worrying if I'm putting the other person out). Grandma used to take the bus every week over to our house to clean, because Mum was a single-working mum, and that was what she knew she could do to help. After church and Sunday lunch we would spend the afternoon all togther and after the Antiques Roadshow, she would go home clutching a bag with all our laundry for ironing. When I was being my stubborn, sulky self, she would take me to one side and urge me "be good for your mum". It would have been her 91st birthday last week and I still miss her. I know that her last couple of years were not the happiest and her frailness, ill health, increased dependence on my Mum, and imminent move out of her home, meant she was ready to leave us, even if that was something we were never going to be readied for. Whilst everyone was on holiday in August, I spent a weekend visiting her in the care home she'd entered 'for a summer rest', but which we all knew would be a permanent move. I had the chance to share her last day with her. It was a warm day and I read her the postcard my sister had sent her from the last leg of her South American backpacking adventure; told her I expected Mum would be calling on Sunday evening from her (much needed) Spanish walking trip; she strained to smell the freesias which I had bought her and then turned to sleep the rest of the day, whilst I sat next to her reading. I remember her being in bed, without the strength to turn herself and unable to take much of the water which the nurses were asking me to try and persuade her to drink from a nursing mug. I'm still not sure if she heard me say goodbye when I left for the evening and that I would be back tomorrow before taking the train home to London. So, it shouldn't have surprised me when I had the call the next day, from my aunt in Cumbria, to say Grandma had died that night. I know my Mum and sister find it difficult that she didn't hold on a couple more weeks to wait for them to come home and say goodbye. That's what happens in the books and movies, right? Well, maybe she was more stubborn that we gave her credit for. She'd definitely had enough. I'm just happy that now when I dream of her she's still the Grandma who took me to the local park and tickled me when a photo was being taken, so the image I'm left with shows me on the ground, legs akimbo, flashing my knickers; everyday after school fed me ham sandwiches and cups of tea in her bedsit, when I was waiting for Mum to finish work; that I had to lie to that the crash in the kitchen wasn't Mum swearing as she dropped the tray of roast potatoes for Christmas lunch, which would be scooped up and served, 'not a word to Grandma'; who wrote me letters when I was at University, that apologised for how little news she had to write; whose annual holiday was a few nights in a Bed & Breakfast 10 miles down the road in Bournemouth, for a change of air; gave me 40p pocket money a week (and my sister 20p, ha!) and who, for an average sized woman, gave a surprisingly tight hug. She still makes me cry to think (and write) of her, but as Mum said at the funeral, she deserved our tears. Oh, and happily, everyone told me the Lemon Surprise was lovely, and the whole dish was polished off, plates clean. The countryside has come to Reims for a three day market (not that it had far to travel!). The main streets are full of stalls and sellers of local farm produce - meat, terrines, jams, dairy and all the finest fattening, heart stopping foods the region creates. I love the fact that the French have no qualms about where the food has come from. Fifty yards from our front door there is a pig pen with piglets and mother, complete with sign explaining how long the piglets will stay with their mother before they are killed. I'm sure they put it more prosaically than I do - but that's the gist! So, cattle, goats, sheep, chickens and pigs are residing on our main street and it's a really pleasant, though slightly smellier, stroll. 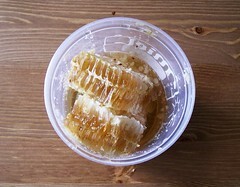 I've stocked up on dried wild flowers, 'raw' milk from the dairy (i.e not pasturised to death) and the honeycomb pictured above. I'll take another walk today to see what takes my fancy. Before I do that, I just need to spit out the ball of wax I've been rolling around my mouth for for the last ten minutes. Back from stroll, where I came across a shepherd with dog and crook, herding a gaggle of geese along the high street. Wildly surreal and I'm annoyed I didn't have my camera with me. New purchases include, two types of soft cheese, another litre of "raw" milk, a chicken (which - eek - as I put it in the fridge I discovered still has its head on), creme fraiche and half a dozen eggs. Father Frog, supposedly resting, leaning out of his bedroom window and taking potshots at the birds eating from the fruit trees in the garden. After over a week of wishing Father Frog well; waiting for news from the doctors to hear if the operation went to plan; giving offers to sleep in the big, empty house in which Mother Frog is scared (errr, not my offer); popping around to visit Father Frog (and trying to fight through the hordes of visitors); Father Frog was allowed to come home last night. Whilst it'll take a couple of months to physically recover from the surgery, nobody is fretting much over his mental health. On the drive back to the house he told Mother Frog off for the things that hadn't happened whilst he was away and on first seeing Frog, asked him to account for exactly what he'd been up to during the day's so called work. This, I think, was a relief for all the family to see things heading back to normal. Which is why when discussing my future employment plans (or lack of) last night, Frog's comment, "You know we can't employ you at the house", was one I chose to shake my head at and look at him like the strange Frog he is. No siree. I'm happy to help out at the house in my spare time, but really, can you imagine having boyfriend's parents as your employers?! 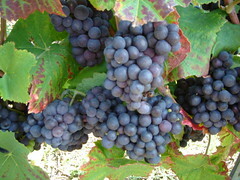 We expect that the harvest will be called (the AOC decides the date, not the vinegrowers) around the 12th September. With only a few days notice given before the start, Frog Family are trying to get as much ready as possible (in between visiting Father Frog in hospital, where he is doing well after his operation). Frog and his brother spent time last week cutting back the leaves on the vines, to ensure the last of the summer's strong sun reaches the grapes. Frog and I took today for ourselves. Since we haven't had time for a good argument in a while, we seemed to devote this morning to that and then had a far more pleasurable time cycling around the vines and nearby villages this afternoon. It was hot! Thirty degrees and I've created the strap marks I spent all summer trying hard to avoid. As you can see, the grapes are looking beautiful. I peeled and tried a Chardonnay grape. They never taste like the ones on the supermarket shelf (they're not allowed to water them and too much water content is undesirable) but there was some sweetness in the juicy flesh. Amongst all the butterflies, bees and wild flowers that grow by the vines, I spotted a small cluster of rosehips. I had been thinking about them just this week, in the Hamburg hotel who served rosehip jam for breakfast. I tucked into it and thought of when mum used to make rosehip syrup for us when we were small. There weren't enough of the ripe hips to collect today, so maybe I'll go back after harvest. Given the hills I cycled today (we're not next to the Montagne de Reims for nothing) I'll need that time to recover!